This handcrafted end table can be easily combined with our Zoila bed (bed 30) and with our Zoila armoire (arm22). These three pieces of custom furniture will provide your bedroom with a spectacular, Spanish colonial style presentation. The end table is beautifully finished with red, antique stain, and with gold, antique highlights. 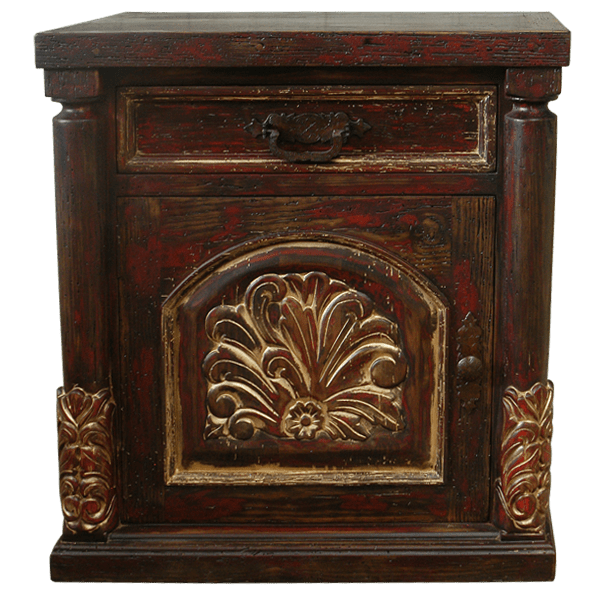 This custom furniture features a cabinet door built with an arched design, and the door panel is embellished with hand carved, floral designs in its center. 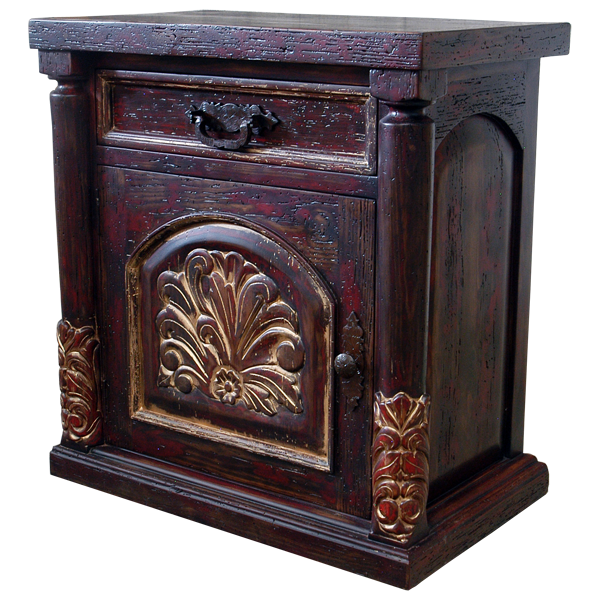 The arch of the cabinet door and the floral designs are highlighted with antique, gold stain. The cabinet doors are also adorned with hand forged, pull handles. Directly above the cabinet door is a rectangular drawer, and centered in the drawer is a hand forged, iron handle. The front of this furniture is framed by two, wood turned columns with hand carved, floral designs on the base of both columns. The floral designs are also highlighted with antique, gold stain. This custom furniture has a decorative panel on each side, and the end table rest on a lovely, wood molding base. This durable, end table is made with the best, sustainable, solid wood available, and it is 100% customizable.